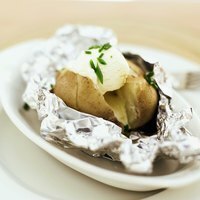 If you like your baked potatoes steamy and hot, with a soft skin that cuts like butter, wrap them in aluminum foil before popping them in the oven. While wrapping the potatoes with the shiny side of the foil facing in may seem like the thing to do, it doesn’t necessarily affect how the potatoes cook. Switching the foil to shiny side out may make for a pretty presentation, but don't expect the switch to alter the baking time. Aluminum foil is made from 98.5 percent aluminum. The other 1.5 percent is made up of silicon and iron to give the packaging material its strength. The metal alloy is melted, resolidified and rolled into a thin foil with the aid of a water-cooled rolling system. As the foil passes through the rolling mill, the rollers create a shiny side and a dull side. The side that passes through the polished steel rollers is the one that becomes shiny. It is a common misconception that the shiny side and dull side of aluminum foil serve different purposes in cooking. In fact, some cooks wrap potatoes in aluminum foil dull side facing out during baking with the belief that the shiny side reflects heat toward the potato, cooking it faster. This is just not so. When baking potatoes, the aluminum foil performs the same -- shiny side facing in or out. When you wrap a potato in aluminum foil, the foil acts as a heat conductor. Regardless of which side you have facing in or out, the aluminum foil acts as a reflector. Any heat radiation that builds up in the potato during baking remains inside the potato, thanks to the reflective properties of the aluminum foil. Even when cooking is over, a baked potato can remain hot for an indefinite amount of time wrapped inside the unopened foil. Although aluminum foil keeps potatoes warm after cooking, it does not keep the potatoes hot enough to prevent dangerous bacteria from growing. Botulism is caused by Clostridium botulinum, which can cause paralysis and a variety of other symptoms that can be fatal. The bacteria thrive on foil-wrapped potatoes standing at room temperature. To guard against botulism poisoning, serve foil-wrapped potatoes immediately after baking, or unwrap and store the potatoes in the refrigerator until you are ready to eat them.